Christmas is literally only a month away and now it's time to start thinking about different gift ideas for your friends and family. I decided to prepare a collage just to give you some gift inspiration. It includes my favourite products I love to give as well as receive in the gifting season. 1. Homeware is something that is very personal to every individual's taste so you need to know their personality quite well, when buying specific items. But it's a lovely present to give - it looks expensive, thoughtful and is also very useful. Interior design and homeware products have become very popular and diverse in the last couple of years. So the array of products is endless. 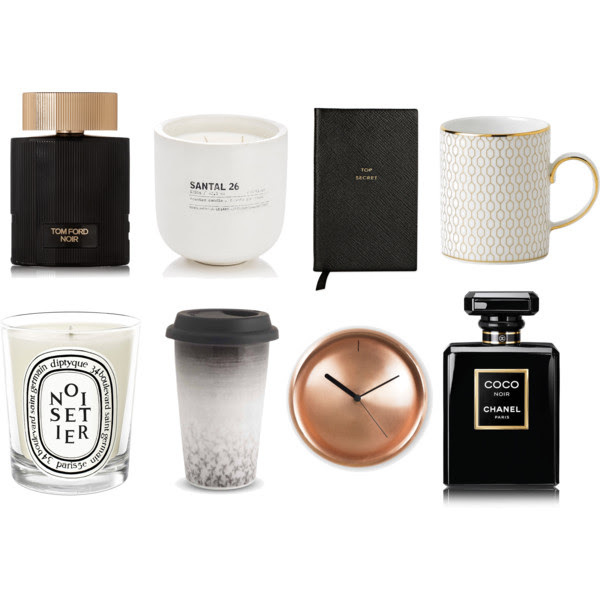 This year there are some trends that you may have seen all over Instagram and Pinterest: rose gold and marble items and everything with the Scandinavian feel to it - minimalist, black, white and grey products. I always opt for the notebooks, coffee cups/mugs, books, clocks, vases, etc. 2. Candles are another great gift because they both look and smell great. When in doubt always go for a nice candle and you'll be good to go. If you need something affordable but still nice I recommend you to go have a look at Primark candles - they all look and smell great and have very afforardble prices. If you want to have something more expensive, I would go for the Yankee Candles - they're timeless and well-known. However, if you want the pure luxury, go for the amazing Diptyque or Jo Malone candles - very expensive and definitely a splurge item, but look absolutely beautiful. 3. Perfumes are the most universal gift you can get. I especially love Tom Ford Noir or Chanel Coco Noir because they have gorgeous black&gold luxurious packing and smell divine. These two perfumes will give your gift a sense of luxury and sophistication. If you want a more "affordable" gift there are many different perfumes to choose from - Lancome, Marc Jacobs, Chloe, etc. You just need to know in which direction you want to go regarding the scent - floral, sweet, fresh, woody, citrus, etc. You can find out more about that on a variety of websites, which have guides to help you choose the perfect scent. Hope this gives you some inspiration for your Christmas gifts. Have a great day and see you tomorrow!